micah (Micah Cohen, politics editor): Today’s topic: OPRAH!!! Are “celeb” candidates here to stay? Or, put another way: Was Trump’s election a turning point of sorts? How would Oprah do as a presidential candidate? Let’s start with No. 1. Is all this Oprah chatter just for fun? Is it overhyped? What do you all make of the media response to her Golden Globes speech? micah: Are you surprised by that, though, Clare? micah: By the media jumping straight to 2020, bypassing the substance of her speech. clare.malone: A little, frankly. The story of women and harassment is a big enough one on its own. Now, her partner did make some comments to the media that stoked speculation after her speech. But I just didn’t expect this level of frenzy. perry: Is it overhyped? On some level, yes. She seems very unlikely to run. But the excitement, I think, speaks to a lot of things that are important in this moment: The hunger for a person who can unify the country, and the view among Democrats that a celebrity who has never been in politics might be better than all of their other potential candidates. Oprah’s actual speech was full of commentary about race and gender in America. We are having the conversations we kind of skipped in 2008 and 2016.
clare.malone: Right, but I think the way that politics people are covering her speech is really vapid. And she wasn’t saying something vapid. I agree that it speaks to a moment, as Perry said — that hunger to have her run. But politics Twitter had this field day with it — and then wrote all these second day stories about how she would actually be terrible — in a way that felt like it undermined the real point of her speech. Which was to say, that whole harassment story wasn’t just a two-month news cycle. perry: Part of it, and I think this gets at Clare’s point, was that the people who watched the speech (forget about the political media) thought it was really great. And that matters. Oprah could have said anything. She’s already famous. The fact that she said THAT, I think, reinforces what many people find compelling about her. I mean, I just want to be clear up top that I think this day-long news cycle has revealed a certain pathology of media. clare.malone: The pathology in American media right now is to find a Trump peg for everything. Sometimes stories are important in their own right, on their own terms. micah: Yeah, that was awkward. perry: I might disagree with Clare slightly here. Trump is, in some ways, part of the sexual harassment/#MeToo story; a number of women have said he harassed or assaulted them. So Oprah and her speech do fit into that in some ways. Also, people want someone who can help the country figure out politics, race, gender, identity — all of these complicated issues at once. People know Trump won’t do that. They hoped Obama would have. There is, I think, too much of that hope around Oprah, but I get it. clare.malone: Trump is definitely a part of the #MeToo moment, but I think it’s grown larger than him, is what I’m saying. I mean, mostly, my point is about not wanting people to lose focus of what she was actually talking about. clare.malone: It is interesting to me that people see the Democrats’ answer to Trump as another celeb. micah: Right, so beyond Oprah, do you all think we are in a moment where an outsider celeb candidate can prosper? I.e., was Trump a one-off or a turning point? clare.malone: We’ve talked about Mark Cuban and the Rock. Harry (Harry Enten, senior political writer): It’s just difficult because we’re getting conflicting statements from within Oprah’s camp. That’s why the presidential stuff doesn’t die down. Stedman says it’s up to the people. She retweets Podhoretz’s article. That’s why the substance of her speech can get lost. clare.malone: She has the great American talent of making people look. perry: The fact that we kind of have a rolling, constant presidential campaign helps people who can get media attention and have compelling personalities. So, yes, I think we are in a moment ripe for more celeb candidacies. I don’t think people will conclude that all celebs can’t govern because of Trump. Trump, for most people, is probably unique and not represenative of how other celebrities would govern. clare.malone: I wonder if Trump makes Democrats less likely to elect a celeb, though. Because if half the message of the left is that Trump is unqualified, doesn’t it require some twisting around to say, “OK, we’re going to elect Oprah”? To be clear, I mean “unqualified” in the sense that she has never been in political office. She is obviously very successful and smart in other ways. harry: The public may be more open to celebs because they trust the government less and less. So more people are willing to take a risk in who they elect. perry: Harry makes a great point about people thinking all politicians are stupid. micah: And maybe, in voters’ calculations, “respect for governing experience” used to cancel out the advantage of being able to garner media attention. Now, we’re just left with the ability to draw media attention. Which is clearly an advantage. clare.malone: Of course. But it’s still a real potential weakness to propose to replace a candidate with no governing experience with another candidate with no governing experience. natesilver (Nate Silver, editor in chief): Popping in from a plane! I don’t know if the political landscape is more welcoming to celebrity candidates, but they may be more likely to run. micah: Nate, you don’t buy the calculus we just layed out? 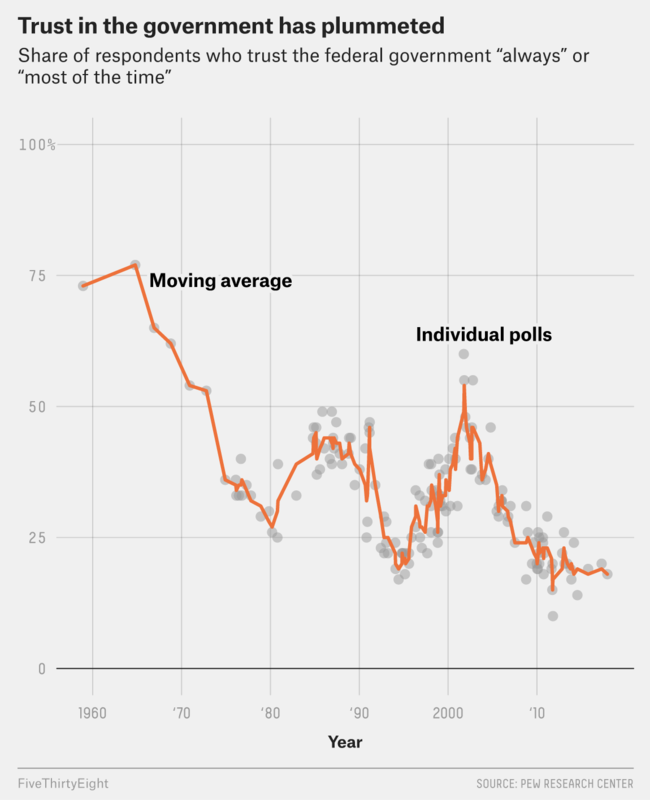 natesilver: It’s not like all that many celebrities — actual celebrities, like Trump or Oprah, not Fred Thompson or something — had tried to run for office. So the sample size wasn’t all that large. Arnold Schwarzenegger and Jesse Ventura were elected as governors, though. And Ronald Reagan was a former matinee idol. clare.malone: Arnold feels like the closest parallel. The most famous, I guess. natesilver: One can argue that party elites losing their grip on the nomination process is important in opening the door to celebrity candidates. More important than the media stuff, since celebrities have always been … you know, celebrities, and had no trouble getting attention. clare.malone: Well, that’s kinda what I mean — don’t you guys think Democratic elites would do everything in their power to tamp down an Oprah run? perry: I think Democrats are torn here, and you can see it with the ex-Obama staffers basically saying that Oprah should consider running. Trump’s governing weaknesses suggest that someone with experience might be better in OFFICE. But I think Democrats are desperate to win the election and would take a compelling person like Oprah since the people with experience are perhaps not as compelling (Hillary Clinton in 2016, potentially Joe Biden in 2020). harry: If Oprah (or any other celebrity) was unable to show a grasp of the issues, then so-said celebrity would be dead on arrival. perry: Oprah would probably be given more leeway on lack of policy knowledge than one of the senators who is thinking about running. Much more. micah: This is why, before the sexual misconduct allegations came out, I was so high on Al Franken. He had some celebrity juice and policy bona fides. natesilver: There would likely be some vicious intraparty battles, but I think Oprah WOULD have some support within the party. Her demographic strengths overlap pretty well with the last two Democratic nominees. clare.malone: Here’s my thing: If Oprah is, in part, exciting because she is a black woman and that’s a constituency the Democrats haven’t rewarded with a national-level candidacy … well, they already have a black woman in power waiting in the wings to run — Kamala Harris. micah: Agreed, but has Harris ever had a two-day period of coverage anything like the last couple of days with Oprah? clare.malone: I mean, no — she’s not Oprah! I mean … do we think the Democratic primaries will be as fractured as the Republican ones were in 2016? perry: I mean, with no clear Democratic favorite, if 15 people are running in June 2019 and Oprah gets in, it seems to me that she will lead in the polls from Day 1.
natesilver: What’s weird is that I think Oprah would be vying for the establishment “lane” despite having no political experience. She’d have trouble with the Bernie Sanders constituency — probably a lot of trouble. micah: Why do you think she’d be an establishment choice? natesilver: Because she’d likely have a milquetoast agenda but will be seen as electable. perry: The idea that everyone who voted for Obama in a Democratic primary will vote for Oprah, I don’t think that is correct. I’m not sure she is winning the wonky (white) liberal vote the way he did. I get the black vote idea, while thinking black voters will want to be sure she’s actually a viable candidate But I don’t see her winning, say, the Wisconsin primary against Elizabeth Warren/Bernie Sanders. micah: But that was Obama’s big innovation, right? Marrying the black vote with the college-educated urban white liberal vote. Just the black vote isn’t enough. perry: Oprah might have more appeal with non-elite, non-wonky voters than Obama did. I just think the coalition might be different. harry: She might basically follow Hillary Clinton’s path, not Obama’s. It may be a combination. micah: Could be more like Clinton’s coalition. So, in 2016, there were a bunch of polls showing that Democratic voters put a higher premium on governing experience than Republicans did. Obviously, that result is, in part, simply a manifestation of respondents’ allegiance to either Trump or Clinton — the experience question was just a proxy for Trump vs. Clinton. But is any of that real? Do Republican voters, who want government to do less, therefore care less about government experience? clare.malone: I think there’s something to that, Micah, the idea that if you want to do away with big government, you value experience in it less. I also think the Democrats do actually have a bloc of voters who find Trump’s lack of experience troubling. And so it would be a bit of a contradiction for them to vote for someone with no real governing résumé. harry: The Democrats nominated Obama, a U.S. senator for less than four years when he started running. The Democrats nominated Jimmy Carter, who had no federal government experience and had been governor of Georgia for only a few years. Republicans nominated Reagan (who was a two-term governor) and George H.W. Bush (former vice president, CIA director, ambassador, congressman). I mean, maybe Clare has a point. But I’m not so sure, myself. perry: I’d imagine Democratic voters do care about experience and governing more. But 1. they really want to win, 2. Oprah seems like she could be a winner, 3. Oprah, I think, could easily turn her book club, her embrace of Obama, etc., into intellectual credibility. Oprah, if she ran, could have her staff mention the great presidencies of the very experienced Walter Mondale, Al Gore, John Kerry and Hillary Clinton. perry: We should talk about the general election. Are we sure a black woman can be elected president? The idea that that would hold true in a general election is crazy. I’d bet my savings account that things would get nasty. clare.malone: Yeah, I think the rising alt-right tenor of certain places in the conservative media landscape would go for the jugular. micah: Also, I don’t think the media at large learned many lessons about covering a female candidate from Clinton in 2016. For example: this. perry: I don’t deny the existence of sexism and racism in America. But a black man was elected twice, a white woman won the popular vote. A black woman can win. Harris could be elected president if she won the primary. Oprah could too. Even more so. I don’t take Clinton losing Wisconsin as a predictor of much. 2020 is just a different ballgame. And, yes, I think Oprah has a brand that is distinct and well-defined. micah: Maybe I’m a pessimist, but I think Oprah, being black and a woman, would get savaged by certain segments of the media, largely because of racism and sexism. And even the mainstream press would have some trouble, I’d bet. natesilver: I’m anti-anti-Oprah. I think there’s a risk that political elites underestimate her popularity outside of the political bubble. There are reasons to be bearish on celebrity presidential runs. Voters may want the biggest contrast to Trump in 2020. And pundits hyping up celebrity candidates may suffer from recency bias since Trump just won. But I’m bullish on Oprah relative to other celebrities.